Why Do They Call it the Quiet Side? The Quiet Side. That might imply peace and quiet, few people, nothing to do. So is the lakeside of Door County “the quiet side”? The answer is, yes and no. Don’t discount those little towns on the Quiet Side, they have big things going on! In the early days of Door County those visiting came by steamer. Those steamers docked on the bayside of the county, hence people arriving and staying in the bayside communities. By 1920, roads were improved to the degree that more people came to visit the county by automobile than by boat. 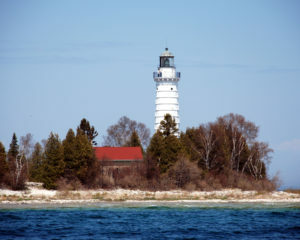 Motorists were warned to come prepared: the trip to northern Door would require at least three spare tires (source: Door County Visitor Bureau). Today you might find some of those bayside communities–Egg Harbor, Fish Creek, Sister Bay–more densely populated with shops, restaurants, and hotel units. Jacksonport and Baileys Harbor are lakeside communities. To a large extent you will find all the attractions, amenities and services on the lakeside that you will on the bayside. The quiet cove of Baileys Harbor is where Captain Justice Bailey dropped anchor to ride out a storm on the lake and protect his passengers and cargo. That ship left Racine Wisconsin in October 1848 and was bound for Detroit Michigan. A year later a village sprang up along the shore where Captain Bailey moored, and was named Baileys Harbor. The Captain’s employer was intrigued with the area so much so that he purchased a little island at the mouth of the harbor (for a whopping $100) and was able to convince the Federal Government to place a lighthouse at the entrance to the harbor in 1851. That lighthouse came to be known as Bird Cage Lighthouse. Visitors on steamboats and settlers in horse-drawn wagons soon started to arrive. The steamboats docked at what is now Anclam Park on the south end of town. In its early days Baileys Harbor was a logging camp, a point for shipping, and it was originally the county seat for Door County. The Lake Michigan shore along the little town of Baileys Harbor offers lots of opportunity for spectacular sunrises and water activities. Inland there are many acres of wilderness and wetlands that have been preserved for the enjoyment of generations to come. Little-traveled backroads for biking and walking, hiking among the preserves, apple picking in the fall, picking cherries in the summer, snow shoeing and pond hockey in the winters, and learning to identify bugs & trees & butterflies & wildflowers at the Ridges are among the activities you will enjoy in Baileys Harbor. Kayaking on Moonlight and North Bay, windsurfing and kite-boarding off Anclam Park, soaking up the sun and swimming at Anclam Park or Ridges Beach, and fishing for Brown Trout and Steelhead are among favorite water activities. Looking to grab a bite to eat, a picnic lunch for the beach, or a romantic dinner. Baileys Harbor has something for every occasion. Bearded Heart Coffee and Custar’s Last Stan are you spots for coffee, pastries and ice cream. Among the bars, pubs and restaurants you’ll find Baileys Harbor Cornerstone Pub, the Blue Ox Tavern, Coyote Roadhouse (on the shore of Kangaroo Lake), the Door County Breweing Company/Tap Room & Music Hall, the restaurants Thyme and Chives, and the Florian II Supper Club (on the Lake Michigan shore). Want to pack a picnic lunch and spend a day at one of the Baileys Harbor beaches or out on your boat? Many of those same bars and pubs offer deli and carryout. The Top Deck at Gordon Lodge (on North Bay), Thyme, Chives and the Harbor Fish Market and Grill are excellent choices for that special night-out dinner. Fresh Fish? The Baileys Harbor Fish Company catches native fish and sells them at their fish house on Ridges Road. Whitefish that are fresh or frozen and other seafood choices are available too. They’ll even process your sport fishing catch. Find them all at Baileys Harbor Fish Company. A trip to Door County would not be completed without a stop at one of our wineries or breweries. Baileys Harbor has some great choices in Stone’s Throw Winery, Door County Brewery, and the Hacienda Beer Company. Shopping at the Market! From furniture to organic eggs, and fresh fish to one-of-a-kind clothing, Baileys Harbor is a one-stop shop! Indoor for the winter and outdoor May through October, the Baileys Harbor Farm Market is one of the best. What’s Next offers fabulous and unique fashions, NAOT shoes and Source water shoes. Look great around town or on the beach! Nathan Nichols & Company is an upscale furniture gallery with antiques, Baker furnishings, plus rugs and lamps chosen from around the world. Morning Mist Studio & Lupine Antiques is a fine art gallery that features the work of award winning artist, ED Fedendaels. In the antique gallery you’ll find a wonderful section of collectibles. Rent or buy a clear bottom kayak at Lakeshore Adventures. Paddle boards, fishing tackle, snorkels, bikes, boats and jet skis–rent or get them all here. At Bazylli Studio the Wearable Art Gallery you’ll find one-of-a-kind jewelry and clothing. This gallery focusses on organic textiles that are free of toxins. Koepsel’s Farm Market, Waseda Farms, and the Sunday morning craft market all offer a variety of shopping experiences from food to fun gifts. Soaking up the sun, windsurfing, or snorkeling to see an old shipwreck, you can do them all at Baileys Harbor’s beaches. Tucked away on Ridges Road, Ridges Beach feels almost private! Anclam Park Beach is located downtown. A sugar sand beach, and the winds are just right for kiting. Is it a place to launch your boat that you want? The Kangaroo Lake Boat Launch is located at 7563 South Kangaroo Lake Drive. Another great spot to launch your kayak or canoe too. Search for all the Baileys Harbor listings at www.HomeInDoorCounty.com/ListingsByLocation. Search by property type–homes, condos, or land–or search by price. You won’t find an easier search around! They call it the Quiet Side of Door County. Is it really so quiet? The answer is, yes and no. Perhaps less populated, but don't discount those little towns of Jacksonport and Baileys Harbor--they have big things going on and lots to do every day.